Beypore or Beypur is an ancient port town and a Municipality town in Kozhikode district in the state of Kerala, India. The place was formerly known as Vaypura / Vadaparappanad. Tipu Sultan, ruler of Mysore, named the town "Sultan Pattanam". There is a marina and a beach while Beypore port is one of the oldest ports in Kerala, which historically traded with the Middle East. Beypore is noted for building wooden ships, known as dhows or urus in the Malayalam language. These ships were usually bought by Arab merchants for trading and fishing but are now used as tourist ships. According to Captain Iwata, founder member of the Association of Sumerian ships in Japan, Sumerian ships might have been built in Beypore. There is evidence to prove that Beypore had direct trade links with Mesopotamia and was a prominent link on the maritime silk route. Beypore was ruled by four Kovilakams - Karippa Puthiyakovilakam, Manayat Kovilakam, Nediyaal Kovilakam and Panagad Kovilakam. As the Gazetteers explain, the Beypore amsam itself had four Kovilakams called - Manayatt kovilakam, Nediyal kovilakom, Puthiya kovilakom and the Panangat kovilakom belonging to the family of the Beypore branch of the Parappanad family. So we have North and South Parappanad factions to start with, branching off the Parappur lordship. The North faction was further split into Beypore, Cheruvannor and Panniyankara Kovilakoms. Considering that Ravi Varma and his brother mentioned Beypore and the specific Manayyat location, let us for a moment assume Raja Ravi Varma hailed from the forerunners of the present Manayyat kovilakom. 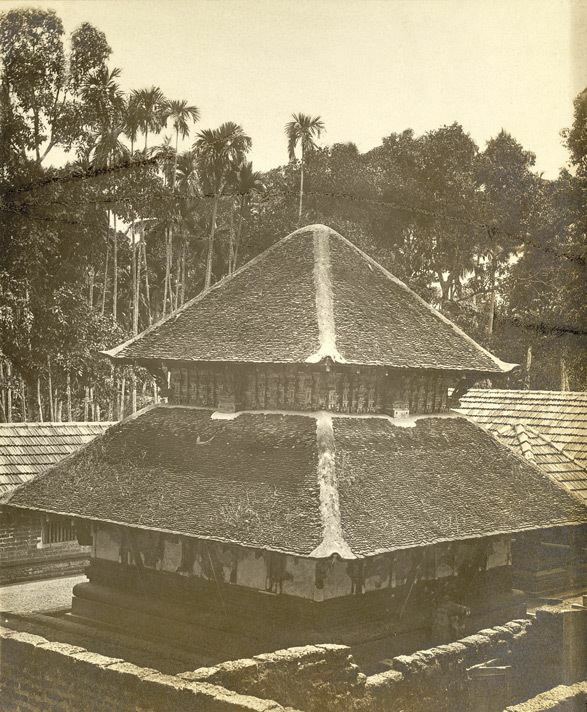 Raja Raja Varma in his diary states - Near this ‘Beypore’ Kovilakam or house is a temple of Vettakaruman or the Hunter God which it is said and acknowledged by its present owners, the Manayam Rajahs, once belonged to us of the Tattari Kovilakam house, by which our family was known. Based on all the above, I would assume that the original Parappanad rajas named their home the Tattari Kovilakom. It is from this home, which incidentally is further linked to the Kolathunad Rajas (Kolathiris) that various rulers (such as Marthanda Varma) and consorts as well as adoptees to the Travancore kingdom originated. Of course as we see, the ruling kind usually reserved the right on the name raja and took affront to another cousin using the title while a raja was in power and complained, but then again, Ravi Varma in reality had some self-projection in mind, as we note. Now let us study the relations between the Parappanad Kovilakoms and the Travancore royal family to see where and how Ravi Varma fits in. Beypore port is a Sub-port of Kozhikode port and is situated approximately 10 km south of Kozhikode. The land for the port was acquired from Beypore Karippa Puthiyakovilakam in the year 1963-64. It is an estuarine port, where Beypore river discharges into the Arabian Sea. Beypore is 180 km North of Cochin and 391 km away from Trivandrum. Beypore port is the second biggest port in Kerala after Cochin and currently handles about 100,000 tones of cargo and 7500 passengers per annum. The nearest ports are Kochi and Mangalore. Now the port has a depth of about 5 meters alongside wharf and approach channel and it is proposed to be developed in stages and utilities like storage shed, cranes and tugs are already installed. Beypore port is one of the oldest ports in Kerala from where trading was done to the Middle East. The Uru (boat), or "Fat Boat", is a generic name for large Dhow-type wooden ships made by vishwabrahmins in Beypore. This type of boat has been used by the Arabs since ancient times as trading vessels, and even now, urus are being manufactured and exported to Arab nations from Beypore. These boats used to be built of several types of wood, the main one being teak. The teak was taken from Nilambur forests in earlier times, but now imported Malaysian teak is used. Beypore is located at 11.18°N 75.82°E﻿ / 11.18; 75.82. It has an average elevation of 1 metre (3 feet). 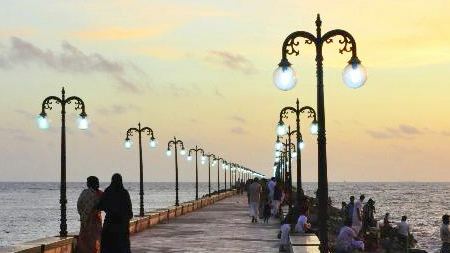 By road : Beypore is well connected by road and is just 11 km from Kozhikode. As of 2001 India census, "Census of India 2001: Data from the 2001 Census, including cities, villages and towns (Provisional)". Census Commission of India. Archived from the original on 2004-06-16. Retrieved 2008-11-01. Beypore had a population of 66,883. Males constitute 49% of the population and females 51%. Beypore has an average literacy rate of 81%, higher than the national average of 59.5%; with 50% of the males and 50% of females literate. 13% of the population is under 6 years of age. Vaikom Muhammad Basheer (21 January 1908 – 5 July 1994) was a humanist, freedom fighter, novelist and short story writer. He is fondly remembered as the Beypore Sultan. Pulimuttu- Pulimuttu is the local name of the 1-kilometre-long (0.62 mi) bridge made of stone stretching in to sea. It is made by piling stones like a pathway to sea. Beypore light house is situated at the south bank of chaliyar. Indian Coast Guard has established its only third station in Kerala at Beypore, namely Coast Guard Station Beypore. It was commissioned on 25 May 2006.